The summer lesson schedule is off to a great start. Both lessons were full. Bob Graves brought some new teaching techniques back from Padre Island that proved to be very effective getting students up and sailing. There are pictures and narrative about the lesson in this newsletter and on Facebook. SPSC also added more new members at the lessons. I want to thank Mark and Kathy Voigt, Charlie Yontz, Bill Olson, Linda Downey, Tina Mazanek, Mark Powell, Richard Hill, Scott and Julea Williams, Nora Loyd, Chris Graves and our Lessons Leader, Bob Graves for helping make these so successful. If I left anyone out, I apologize. The names are from memory. The memory chips are old. The NIMBY is coming to town beginning this Friday. Er, that is if you live in Panama City. This is a long standing event/tradition that to me serves at least two purposes. One, the locals at Shell Point will have to find something else to do for entertainment. SPSC won't be there. 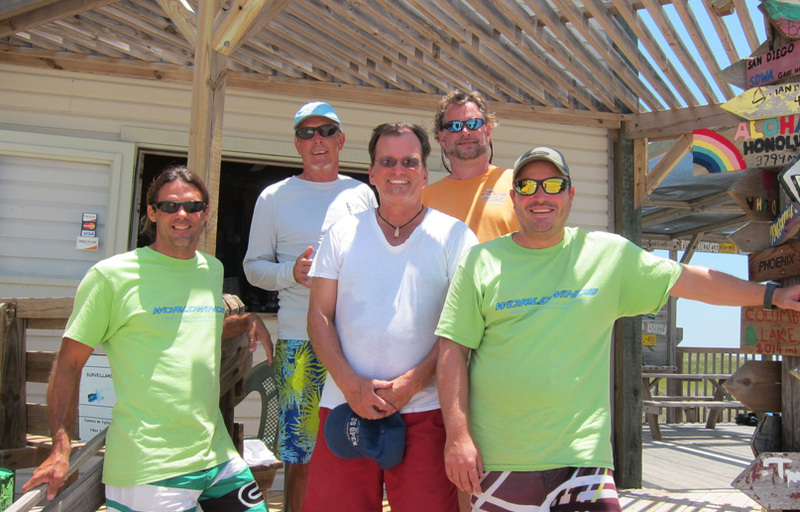 Two, the backyard we invade, in this case the Panama City Yacht Club, will never be the same. Come join us for sailing, socializing, sipping the infamous Finney punch, sampling the hors d'oeuvres and soaking up the sun and fun at Shell Island. The details are all presented in the NIMBY link on our website. While it is still months away, the Endless Summer regatta is on my mind. Why? The Commodore is responsible for organizing this event and I was reminded that I am the Commodore (see earlier reference to old memory). So mark your calendars and reserve the weekend of September 28th thru the 30th for the “Last” (according to Mayan calendars) Endless Summer Regatta. Also, please join us at the monthly SPSC general meeting at Beef O'Brady's this Tuesday, June 12th. 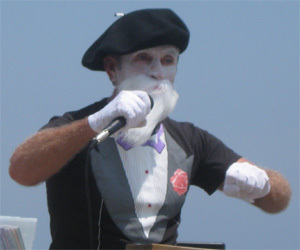 NIMBY XVI, the 16th Annual "Not In My Back Yard" Road Trip Regatta, is scheduled for Friday, June 15 – Sunday, June 17, 2012. It has now been sixteen years since we conceived the concept of taking our show on the road to different venues. This year, we're again returning to the scene of some of our best regattas, Panama City, FL. We have participated in events in Panama City for years, from the old Shell Island Shot in the 1980s to Rude Roy's Power Run in the 1990s to our own NIMBY events in the 2000s. We extend a special invitation to our sailing friends from the Florida Panhandle, and to the Atlanta and Charleston sailors, to join us at this year's NIMBY location. From the restored old downtown section of Panama City to the beautiful water and beaches of St. Andrews Bay, there will also be plenty for the non-sailor to do. Check out the complete details for the event. Click Image for Larger View What a great day we had on the beach for our first kids’ day. Thanks to all the trainers, Tina, Bob A., Bill, Mark Powell, Charlie, Nora and thanks to Juile for filling out the Presidential Fitness awards and to my brother Chris for rescuing one of our young sailors, Matt, as he headed towards Cuba, with dreams of revolution and a Marxist utopia. The kids seemed to have a great time and the smiles on the parent’s faces was even better. The kids took their initial lessons and then kept coming back to go out and sail some more. Summer was worried about going out on the board alone, so Tina jumped on the board and sailed a little bit with her. Summer came flying back in on the board herself. The ages were from five to thirteen and they all listened and performed admirably. Even when the kids weren’t sailing they were having a great time playing together on boards without sails and just swimming. Please check out the pictures on our Facebook page and the video of young Kelci, 13, uphauling the sail and taking off like a pro. (Click on images for larager view) Go to our FACEBOOK page to see the full Corpus Christi photo album. 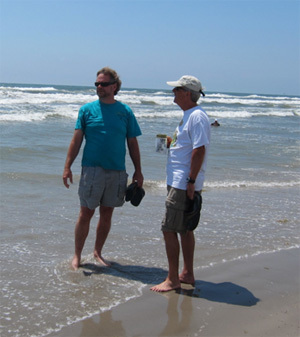 Bill is from Corpus Christi and has sailed out there several times. He mentioned that he would like to get a group trip out there. The group that tripped out there was Perry, Bill, and Bob G.
We took off Saturday morning, May 12, at 6am from Bill’s. Y’all have heard of ATVs, WMDs, and BVDs, but we drove out in a MMV aka a MIGHTY MINI VAN!! The van was setup with air mattress in the back which Bill took advantage of as soon as we got under way. The drive was uneventful though Bill hit some pretty hard rain in Louisiana. Unlimited streaming on Perry’s phone gave us all kinds of great music and comedy skits on the way out. Stopped and ate in Louisiana at a place fittingly called Jerks. We arrived at Scott’s (Bill’s brother) house at 10:15 after stopping at the grocery store for supplies of beer, bagels, and cream cheese. We all slept like the dead Saturday night, with Perry on the couch in the living room, Bob on the air mattress in a guest room and Bill on a futon in the other guest room. 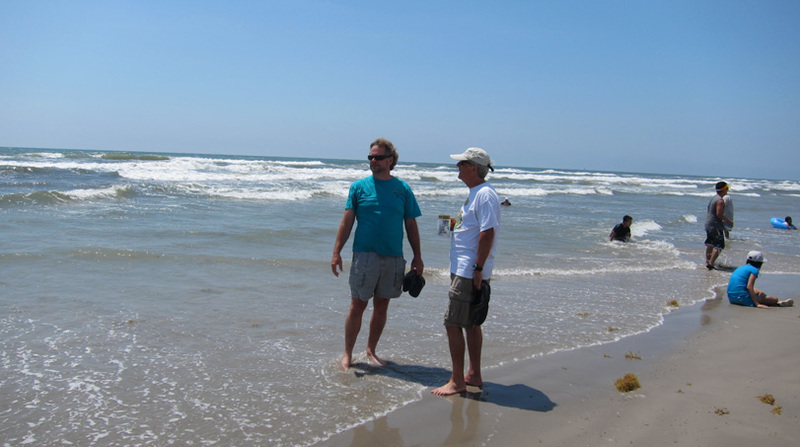 We woke up to no wind, so Bill took us on a tour of Corpus and took us to beautiful Padre Island. 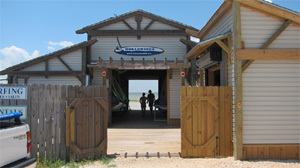 Bob bought a board at Worldwinds windsurfing located on the shores of Laguna Madre. Visited a variety of launch sites and met Bill’s mom who is indeed the saint you pictured her to be since she raised Bill and 4 other kids. 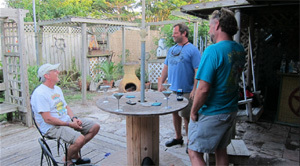 A beautiful day ending with martinis and steaks in Scott’s backyard! Can’t forget little Chipper, a rat terrier, who loved to piddle on Perry’s crocs in his excitement to see him. On Monday, the wind was once again elusive, so we went on a tour of the CSV Lexington, an aircraft carrier that served in WWII, Korea, and Vietnam. One of the high lights was a liquor store named Specs. Saw brands of Scotch, Gin, and Rum we’d never heard of, but had to try. I’m sorry I only had three credit cards with me. Tonight we drink Botanist gin martinis. On Tuesday we went to Padre Island hoping for wind and got some, mostly from surrounding storms. Perry got about a 30 minute good sessions in while Bob and Bill floundered on their short boards. 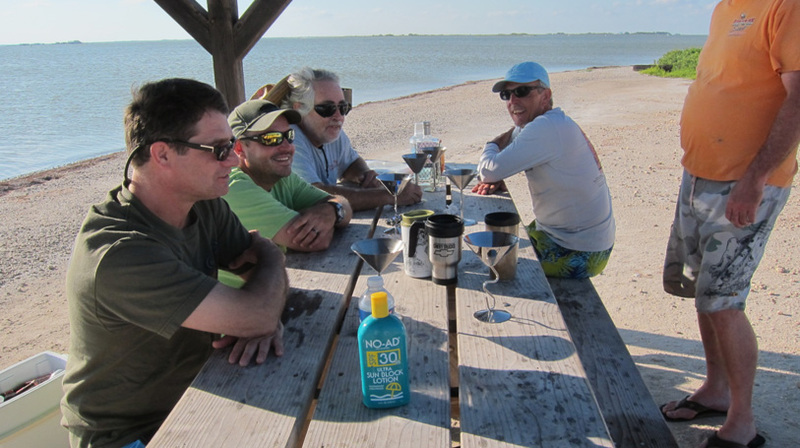 Bob found out the “up the nose” way that Laguna Madre has a much higher salt content then the gulf. In the early evening we met up with Randy Rhodes and Don, the owner of Worldwinds, for some beers at a gulf front place called Barnacle Bills then went to eat some Mexican food. Joining us there was Bill's brother Scott and Randy's lovely wife, Angela. Randy regaled us with stories from his many adventures in the sport. 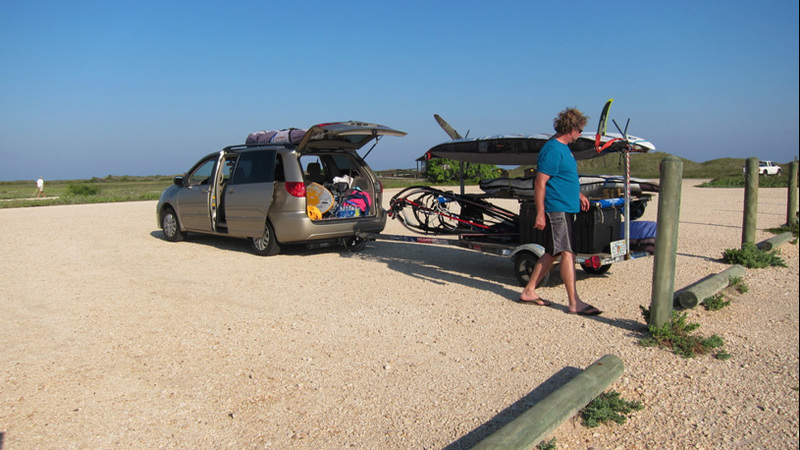 On Wednesday, Randy let me observe both he and Olivier teaching beginners windsurfing classes. The water here is ideal for teaching due to the relative shallowness with relatively no tidal change. You have to go pretty far out if you are an adult for it to be over your head. The first 30 yards of beach is only up to your knees, so the vertically challenged and kids can even have an area not over their heads. Tried to take notes but the ink kept running and the paper got wet and tore apart. Thursday night we went out and saw Robert Earl Keen at Brewster Street Ice House, an open air bar/performance hall, who put on an incredible concert. Everyone in Corpus knew the lyrics to the Texans songs and it was one great big sing along. Scott and I stood (no seats) about middle of the crowd and Bill and Perry slowly made their way to the front of the stage in order to throw their . . . hands up in the air. When the concert was over beer bottles littered the floor, and that was just from us! No chicken wire up front, though. Wednesday through Saturday had gusty (12-20) east winds all day. Bill and I shared sailing my 152 litre BIC with his 7.5 sail. Able to get some good runs in every now and again, but nothing consistent. Perry came out a few times on Saturday to ride some of the gusts and slog through the rest. We left Sunday morning for an uneventful ride back. Due to time changes and stopping to eat, we arrived home at 12:30am. Though the wind wasn’t what we hoped for, the place and the people far exceeded our expectations. Worldwinds Windsuring (Worldwinds.net), located on Padre Island National Seashore at Bird Island Basin, is an amazing facility; not only do they give lessons and sell and rent gear, but they do all of this with no utilities run to their building. They use cisterns to gather water and have solar panels with a series of chargeable batteries to provide electricity. They are able to pick up signal for one cell phone provider. The rest rooms, a very short walk from their facility, are provided by the National Seashore and are little more than really nice, well dug, outhouses. The only thing better than the facility are the people that work there and the folks that congregate on the beach. Don, the owner, was a great guy to speak to, willing to share what they do in training, and speaking of his business which continues to grow. The staff, who all teach, were wonderful and easy to talk to. Some of you know Randy Rhodes who used to race at many of our regattas and is from the panhandle. His wife, Angela, works part time at the store since she is also a full time nurse. Olivier Jallais, 2000 Canadian National Champ and has a need for speed, was helpful in Bob’s selection of a weed fin. Patrick was the first employee we encountered on Sunday while he was teaching a 5 year old how to sail on a board with a 1 meter sail. On the beach we met a young couple from Maryland who are part of the Baltimore Area Boardsailing Association (/www.windsurfbaba.org), some folks from Dallas who are members of the North Texas Wind Riders (www.ntwr.org), and a gentleman from around Phoenix. We became known as the Florida boys. We were told that having martinis on the beach, as we did from Tuesday through Friday, raised the etiquette bar on the beach. Perry invited others on the beach and at the shop to partake with us, and they did, enjoying their martinis and blue cheese stuffed olives. Meeting called to order at 7:33. 22 bodies present. Welcome back Nora! 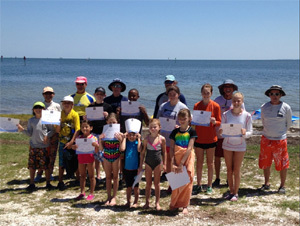 Bob G. spoke about lessons and the kids day on June 2nd. He did not speak eloquently, so thank goodness he didn’t have much to say. The on-line minutes approved by the two people that read them. Glad I didn’t pursue that PhD in writing. Work day – Drying racks installed. Mike L. is missing his Ryobi saw. Great discussion on the topic of a missing saw and how much someone may have gotten for it. Mark V. and Mike L. were not at all pleased with how high the top rail was. Terms were used during the meeting that cannot be printed here. Needless to say, the top rail will be lowered in order to keep the peace. The day before the Sunday workday saw Bob G. and Bill O. assemble the training equipment. We had no police incidents on the beach during the Smith regatta. Even though I saw some people in bathing suits that should have been illegal, the people who shouldn’t have been wearing them were not arrested. Good thing for the beer. A number of people commented on how well the SPSC supports the Smith event. Racing was fun and well run. Wrap up party is on May 18th. There was much gnashing of teeth and moaning about the $2 parking fee during the Smith. We all know Wakulla County is moving towards becoming a socialist/Marxist/Kenyan county and they need to raise funds in order to rename Shell Point to The People’s Beach, so be a good comrade and pay up. Wright mentioned getting a season pass for the beach and is working on it. NIMBY – Get a room. We will be launching from St. Andrews Bay Yacht club. Gear can stay rigged up at the yacht club. Price going up since supper will be included with a keg of beer. The yacht club is about 10 minutes from motel. Purser reported that the club is still on the plus side of $0. If you want to know how much on the plus side, COME TO THE MEETINGS!!! We have 61 memberships with Dan Olivier and Dave Stanger being our newest members. It is obvious our club believes in Chaos theory because that is what I am observing right now. There are multiple conversations, joking, laughter, etc. Out of the chaos came a motion to adjourn, a motion that the Scribe was eagerly listening for, because he quickly seconded it and stopped taking notes. Had to finish my beer.